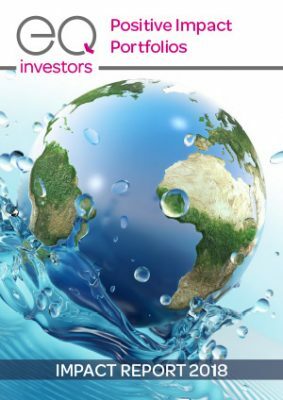 Building on last year’s report we present further evidence to support our hypothesis that investing in companies making a positive impact can be good for returns. Whether you look at revenues, profits, or employees, companies held by the EQ Positive Impact Portfolios are growing significantly faster than those in the FTSE 100 Index. They are also investing significantly more in research and development, have a smaller carbon footprint, and source a higher proportion of their energy from renewable sources. For the first time we are reporting on absolute measures of impact. This is a significant step for us that required a deep dive into the various reports produced by the hundreds of underlying companies that make up our portfolios. We wouldn’t have been able to do this without support from the Centre for Environmental Policy at Imperial College London, and would like to thank them for collaborating with us. We have once again mapped our portfolio holdings to the United Nations’ Sustainable Development Goals. This continues to be a useful framework for us to think about impact – the Goals shine a spotlight on the biggest social and environmental challenges facing our world, and provide focus and clarity on what is required to meet them. They also represent a huge opportunity for forward-looking and innovative companies – just the type we want to capture in these portfolios. Over the last year we have seen record levels of growth in our assets under management and it really feels like we are at an inflexion point for impact investing.